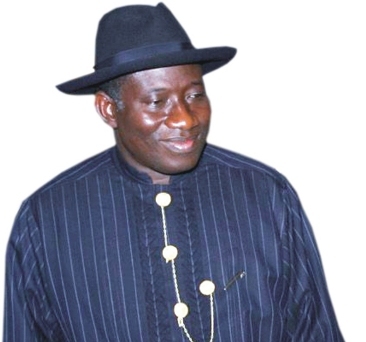 What is the significance of 1-th of October in the history of Nigeria? Why it was chosen as a National Day? First of October 1960 is the day when Nigeria gained his independence from British Colonial Masters, before this date the political entity known today as Nigeria was created in 1914 by the amalgamation of North and Southern British Protectorates. From this day of 1-th of October Nigeria took her destiny fully and firmly into her hands as political leadership came to be exercise by his own citizens, freely elected also by his on citizens in universal suffrage. From this day forward Nigeria continued to build here national unity and to unify several national groups into one united national state. This was, is and will for ever be our mission. This year being 50 years from independence this date is even more important and celebrated. 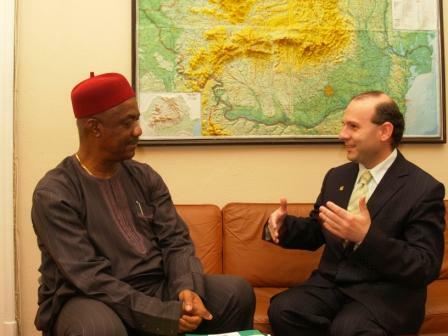 How would your Excellency describe the present day relation between Romania and Nigeria on political, culture ,economy? The diplomatic relations between Nigeria and Romania has been cordial at political level. However there is need for improvement especially among high level officials. Consultations are going to actualize some treaties signed earlier that need taking cognizance of the new realities of Romania becoming an EU member. One of this is the Agreement between Governments of Romania and Federal Republic of Nigeria on cooperation on military field. Top officials of the two countries meet in Bucharest early this month and harmonized the draft. 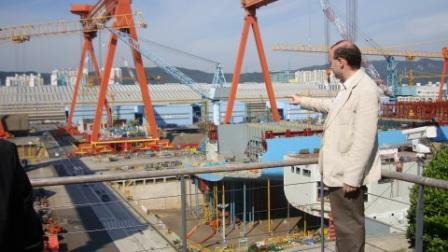 It is hoped that Ministries of Defense of two countries will sign it early in the next year. We have also in the cultural field Nigerian artist resident in Bucharest that held several exposition showcasing Nigerian and Romanian themes. These have been well received by the Romanian public and foreigners alike. Nigeria today and Nigeria of tomorrow, how is developing and changing the most populated country of African continent? We Nigerians and our government we have done to outstanding things; first he adopted a zero tolerance policy on corruption and shaped a policy based on seven programs of economical and infrastructure development of the country. Our visionary government has establish a long term plan called Nigeria 2020 in order to transformed the Nigerian economy as to be one of the 20 most industrialized country by this period end . The aim is that in 2020 we will have a GDP of 900 billion and an income per capita of 4.000 dollars. 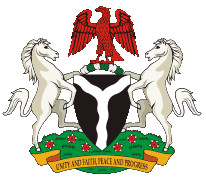 This is a firm intention of transforming Nigeria economically, politically socially and cultural. Our country also has undergone a complete resolution of the Niger Delta Conflict establishing a special minister for the developing of the region and granting an amnesty for the misguided rebels. The former combatants accepted this amnesty and lay down there arms. A program of rehabilitation and social inclusion has also being established for them. This recent evolution will reassure all investors, including Romanians that we are having a secure climate for there investments. Plus, as a result of our government efforts Nigeria was elected with a high majority as a non-permanent member of the Security Council at United Nations. Furthermore our country was selected for here stability to host the International Youth Soccer Championship by the FIFA. What is your Excellency message for the Romanian people at this anniversary time for Nigeria? How can we describe the development of Nigeria to Romanians for a better common understanding? It is in the same time easy and difficult to make such a declaration. Nigeria and Romania has gone a long way from establishing diplomatic relations. Political, cultural and economic relations and the quantum of our bilateral relations are continually developing. Romania is a friendly country that assured the instructions for many young Nigerians in his learning institution. My message is that these relations could be foster in our mutual interest. Romania has the technological capacity that Nigeria needs to exploit fully here industrial, agricultural, oil and solid natural reserves. We appeal to Romanians to open there hearts and minds in order to cooperate with Nigerians counterparts to exploit this enormous bilateral potential. In order to do this we have organized a strong Nigerian delegation that visited Romania and was well received by the Romanian Chambers of Commerce and by government authorities. The understandings reach then could be actualized in the nearest future. The area on which we must work now is the tourism, an area where Nigeria has enormous potential and we are warmly inviting Romanians to enjoy the friendship, human warm and hospitality of Nigerians. We have in Nigeria festivals and event throughout the year and on our land the sun is shining all year long. In the last period of time European Union and Turkmenistan relations had known a steady and continuous improvement in economy, cultural and political levels. In the frontline of these warming relations are the European academic elites interested in promoting European Union-Turkmenistan partnership based on common shared values as democracy and free market economy that Turkmenistan and European Union are constructing together. Now Romania and Turkmenistan are building in the framework of European Union –Turkmenistan friendship. On the occasion of opening the first diplomatic mission of Turkmenistan to Romania ,His Excellency Ambassador Shohrat Jumayev ,held an explanatory meeting with a delegation of Romanian Institute of International Relations and Economic Cooperation in order to present to Romanian academics and cultural and diplomatically elite the radical changes that took place in the last years in Turkmenistan and his country role in the Central Asia politics and the importance of Turkmenistan for a good Asia-Europe connection and for the important energy projects in the region. In his expose Ambassador Shohrat Jumayev has presented the most important achievements and accomplishments of Turkmenistan. – Constructing a sustainable economic growth in Turkmenistan , a rapid economic development and the construction of a solid free market economy based in the same time on the correct income distribution and with a highly development of social protection sectors. – The continuous development of social base of Turkmen people by investing in health and education sectors , investment and support that is responding to the most sacred and untouchable human rights such as the right to health ,education and productive life. – The continuous development and protection of cultural and historical patrimony of Turkmen people, the transformation of Ashgabat in the pivotal connection center between Europe and Asia and in a light-house of development for the entire region. 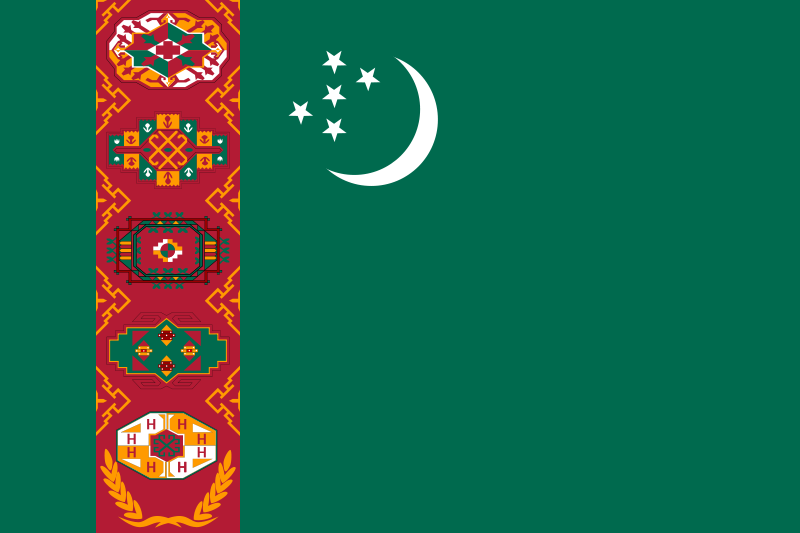 – Continuously supporting peace and security on world stage and in the Central Asia region by important and internationally resounding actions such as transforming Turkmenistan in a neutral state and obtaining international recognition of this statue and hosting in Ashgabat the United Nation Center for preventive diplomacy in Central Asia. The last being an important initiative not only for the region but also for the world keeping in mind the strategic importance of Turkmenistan . 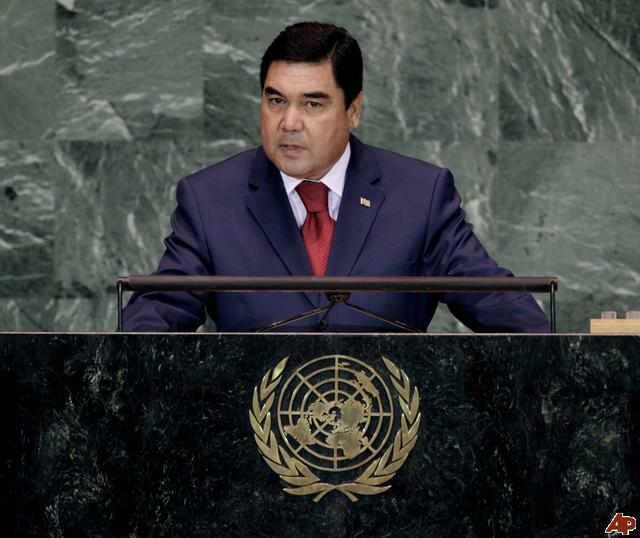 During his speech Professor Anton Caragea has underlined that all this numerous achievements could not being possible without the democratic framework of the country and the steadfast commitment to democracy and rule of law of President of Turkmenistan Gurbanguly Berdimuhamedov. The achievements of Turkmenistan are widely known and respected in Romania and the support that Turkmenistan President is offering for the development of Romania-Turkmenistan ties is extremely important and is appreciated by Romanian academics, politician, diplomats and cultural personalities alike. Turkmenistan is a model to be followed by not only the states of the region but also future economic and social development of Romania will be greatly improved by coping Turkmenistan model of social and economic system .The public presentation of Turkmenistan had enjoyed a wide public interest in all the board leadership of Institute of International Relations and Economic Cooperation but also to other guest invited at the event. Also it was decided that such meetings will be held in the future and also the discussion reach a variety of common interest topics for the further development of Romania- Turkmenistan bilateral ties. 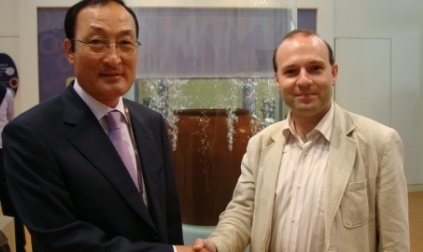 Between 23 of September and 5 of October 2010 in the framework of Next Generation Leaders Visit Korea Program, Professor Anton Caragea, President of European Council on International Relations of European Union was invited for an official information visit in the Republic of Korea. The invitation was made by Dr. Soogil Young, Chairman of the Presidential Commission, President of National Strategy Institute, and Chairman of Korean National Committee for Pacific Economic Cooperation. 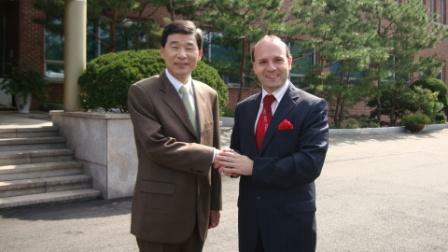 The visit included a complex program of political, economic and cultural visits destined to offer to Professor Anton Caragea a complete image of today situation in Korea and also a chance to meeting key politic and economic leaders interested in cooperation with European Union . The visit included dialogue and briefings at Korea Energy Economics Institute , Seoul Digital Media City , Presidential Committee on Seoul G20 Summit , Korea Creative Energy Content, Presidential Council on National Branding , Korean Parliament Foreign Policy Committee ,Electronic Telecommunication Research Institute, Daedeok Innopolis , Korean Institute of Science and Technology , Hyundai Heavy Industries . 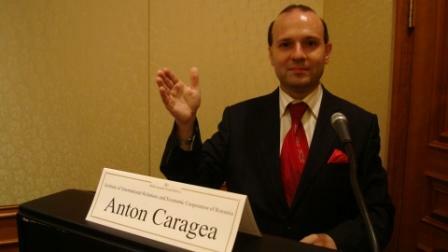 In light of his successful contribution to Organization for Security and Cooperation in Europe (OSCE- Bucharest Conference 2010) Professor Anton Caragea was asked to deliver a key note speech for Presidential Committee on Seoul G20 Summit to explain how it created a diplomatic success and what lesson could be learned for G20 Summit. Another speech was held at Presidential Council for National Branding where Professor Anton Caragea highlighted his creation: European and Romanian Strategy for National Branding. 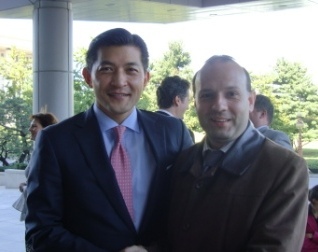 The program included also extensive traveling to Korea from Seoul to Ulsan, Bulguska , Seokguram Grotto , Chumsung Dae and a variety of art, entertainment spectacles destined to offer to Professor Anton Caragea an image of historic and cultural treasures of Korea.